Two weeks ago I looked at the run value of curveballs, sliders and knuckleballs based on their movement. Today I am going to do the same for changeups and three kinds of fastballs: four-seam fastballs, two-seam fastballs and cutters. This work was motivated by Sky Kalkman's Understanding Pitch f/x Graphs piece in which commenters suggested they have a hard time putting pitch movement in perspective. Here is how the pitchf/x system measures movement from my post two weeks ago. The movement of a pitch is the difference between where you would expect the pitch to end up as it crosses the plate based solely on its velocity, trajectory and gravity and where it actually ends up as it crosses the plate. This difference is broken up into its horizontal and vertical components. Then you can plot the horizontal and vertical movements of a number of pitches together in a scatter plot to see the movement of a particular pitch type or from a particular pitcher. As in the previous post I used all the pitches in the pitchf/x database to do the analysis. This presented a problem; in 2007 and 2008 the pitchf/x system classified almost all fastballs as generic fastballs making no distinction between four- or two-seam fastballs, sinkers, or cutters. Starting this year the system made these finer fastball classifications. So the first thing I had to do was go back and reclassify each pre-2009 fastball as a four-seam, a two-seam/sinker or a cutter. Although sinkers and two-seam fastballs are different pitches I had a hard time differentiating them using the pitchf/x data so I lumped them here. I used a k-means clustering algorithm that assigned a pitch to a cluster based on its vertical and horizontal acceleration and its speed. I am fairly confident in my classifications. The average horizontal and vertical movement and speed of each of the three types of fastballs I classified are quite close to the values Josh Kalk found when he classified the pitches. One slight discrepancy is that my RHP's cutters do not have as much positive horizontal movement as Kalk's (and my LHP's cutters do not have as much negative horizontal movement as Kalk's). I think that Kalk reclassified some sliders as cutters and I am missing those since I am just reclassifying fastballs not all pitches. For each pitch type I first show the range of movement for all RHPs throwing that pitch in gray, and then some specific examples in green, blue and red. Four-seam fast are, on average, the fastest pitches (about 1.5 mph faster than two-seam fastballs and 3.5 mph faster than cutters), they 'rise' (drop less than expected from gravity) more than any other pitch and tail in to same-handed batters (away to opposite-handed batters) by about 5 inches. These fastballs include what are thought of as 'high-heat' fastballs. Chris Young has a very effective four-seam fastball that 'rises' more than a foot on average. Dan Haren as of last week had the best four-seam fastball of all starters. 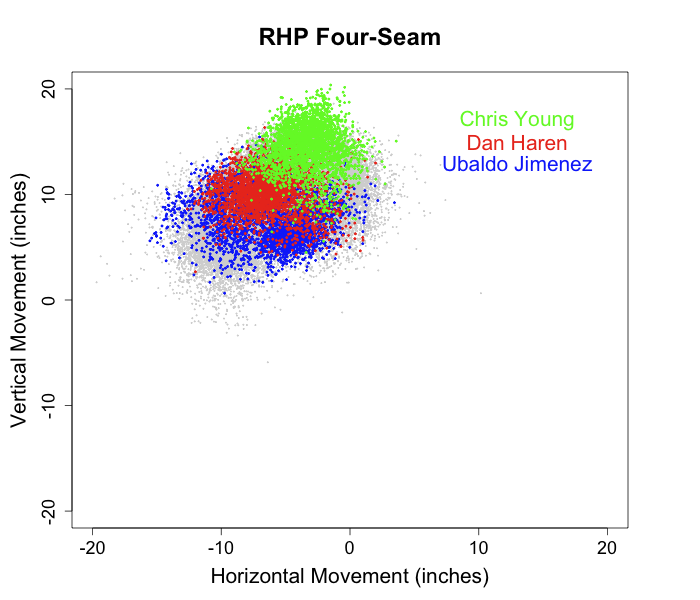 Four-seam fastballs have a large variation in horizontal movement both between different pitchers and between pitches thrown by the same pitcher, for example some of Ubaldo Jimenez's four-seam fastballs tail over 10 inches in to RHBs and others have almost no horizontal movement what-so-ever. The run value images were created in the same way as described in the first post in this series. I just give the RHP ones to keep the post from data overload. In same-handed at-bats the more vertical 'rising' movement the better. This trend is not unexpected, but strikingly consistent. For these same-handed at-bats horizontal movement has very little effect. In opposite handed at-bats a large central region of pitches has a very high run value. These fastballs have 'average' movement, and left handed batters have no trouble with them. Two-seam fastballs are a little slower, tail in more to same-handed batters, and have much less, sometimes even negative, vertical movement than four-seam fastballs. As I said before this group of pitches includes both two-seam fastballs and sinkers. These fastballs, when they are effective, induce lots of groundballs. As of last week Derek Lowe had the best two-seam fastball. It has nice 'sink' and a wide range of horizontal movement. Brandon Webb's sinker is the one of the best in the game, it has even more 'sink' than Lowe's. 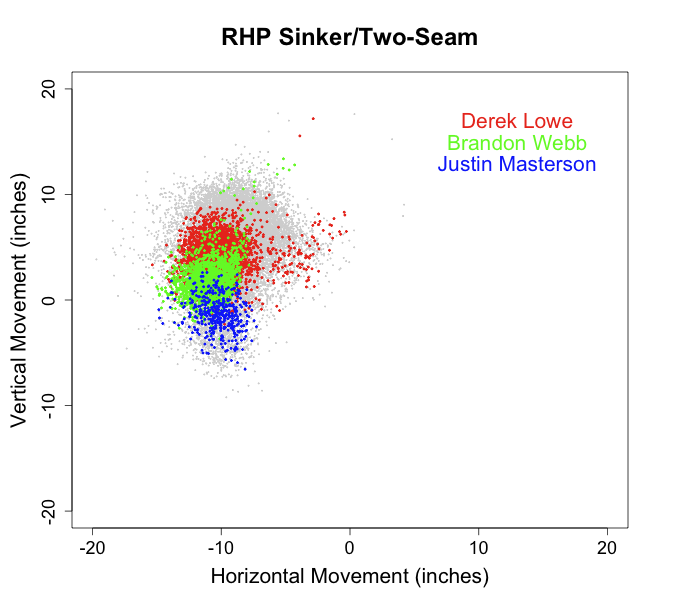 Justin Masterson pitches from a three quarters arm slot and is able to get negative vertical movement on his sinker (it drops more than expected from gravity). Two-seam fastballs have an incredible platoon split. Against same-handed batter they tend to be very good pitches improving slightly with more horizontal movement towards the hitter and greatly with more downward movement or 'sink'. Against opposite handed batters two-seam fastballs are not very effective, and those with intermediate levels of vertical movement get crushed. Cutters are, on average, slower than four- and two-seam fastballs by about 3.5 and 2 mph respectively. Their movement is intermediate to a four-seam fastball and a slider. You can't talk about cutters without mentioning Mariano Rivera's. It is amazingly successful, almost the only pitch he throws and one of the most unique pitches in the game. It has a wide range of vertical break and breaks away from RHBs. 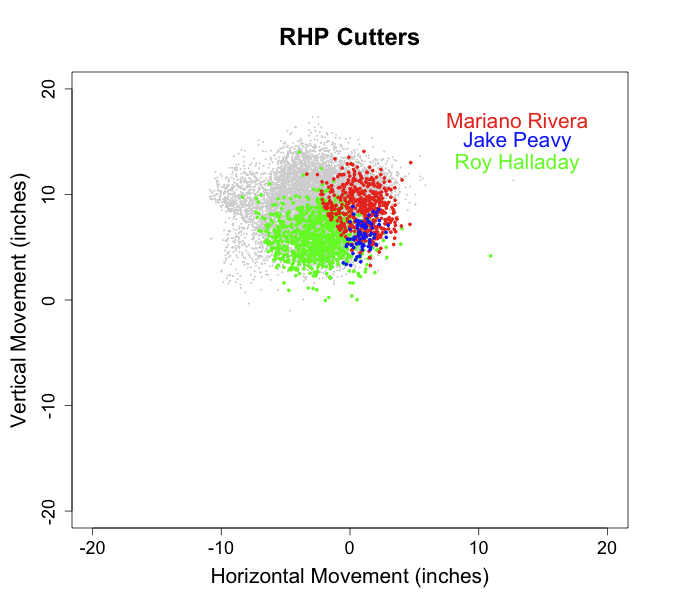 Roy Halladay has a very successful cutter with lots of 'sink'. Jake Peavy doesn't throw as many cutters as Halladay or Rivera, but his have very interesting movement too. Cutters seem to have almost no platoon split. In fact the patterns look the same and are not mirror images of each other as is usually the case. So cutters from RHPs that break to the catcher's left do poorly against RHBs and LHBs, while those that break to the catcher's right do well against RHBs and LHBs. This is quite strange, and helps explain how Rivera can be so successful with just the one pitch. In 2008 no pitcher threw more changeups than Edinson Volquez. His changeups have very extreme down and in movement. 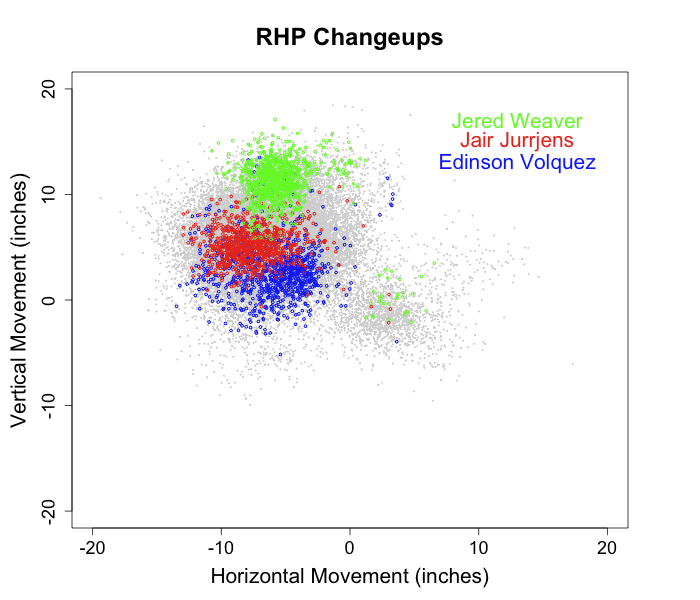 Jair Jurrjens was also in the top five of changeups thrown percentage, his has intermediate movement. Jered Weaver's change has more 'rise' than any other. Changeups are predominately throw in opposite-handed at-bats so I just present those images below. Changeups that have very little movement (close to 0,0) get crushed. Those with extreme vertical movement, either lots of rise or lots of sink, are very successful. Since changeups are thrown in opposite handed at-bats even those with neutral run values are good pitches. The elephant in the room here is pitch speed. The success of a fastball or a changeup is very much tied to its speed, which this analysis ignores. In addition, pitch movement and speed are not independent. John Walsh showed fastball speed positively correlates with its vertical movement. So the success of four-seam fastballs with lots of rise might be since these tend to be faster pitches. In a future post I hope to examine this relationship between speed and movement, and see how they jointly affect a pitch's outcome.